After four years as a SOAS student, I’m about to graduate with a considerable amount of debt, albeit not compared to those now paying historic £9000 tuition fees. If you borrowed money from the government between 1998 and 2012 to pay for your education, George Osborne has, or intends to sell your debt on to banks and private companies. The government has already sold off all pre-1998 loans – worth around £900million – at a massive loss to the public purse. The rest of us will make them around £40billion. They think they have a mandate to do what they like with education now now. Ever since the carnival of fraud, greed and negligence that is free-market finance sent the global economy into cardiac arrest (again) and was bailed out to the tune of £130billion the establishment has been calling it ‘national debt’, a ‘structural deficit’, an ‘imbalance on *our* credit card’ – whatever the line is that best offers an excuse to sell the public services won by people in Britain after World War II. Which they really rather want to do. It took a Freedom of Information request to get any documentation on the student loan sell-off in front of the public, and even then 90% was redacted. 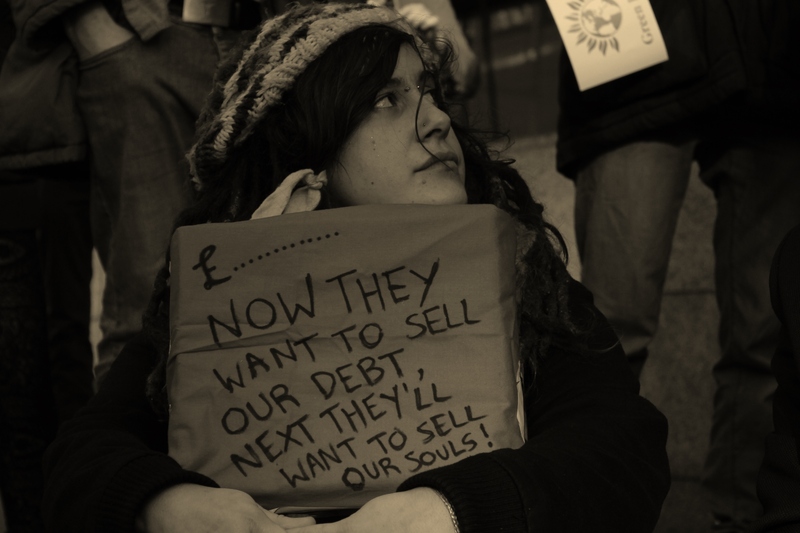 The government has made its promises about leaving interest rates alone (while reserving the right not to), but we know what their promises are worth – students have not forgotten Nick Clegg’s historic betrayal over fees, and Cameron’s abolition of the Educational Maintenance Allowance. Though billed as a money-saving measure, the sell-off is no such thing. The Higher Education Policy Institute has concluded in its report that the policy is based on ‘highly uncertain and optimistic assumptions’ and underestimates the cost to the public because it fails to account for the fact that once in private hands, the government makes nothing on interest repayments. Like rising fees, privatisation costs far more in the long run than it saves in the short – never mind the social cost. The British education system has always been one of the most stratified in the world. But the neoliberal restructuring now underway throughout education, disempowering students & staff while opening up universities to private investment (and all the strings that come with it) threatens to shift university forever out of the realm of right and into that of privilege. This restructuring, combined with savage and politically motivated cuts to public funding impoverishing all but the most ‘fiscally viable’ departments, all falls within the broader context of the Tories’ calls for Permanent Austerity – not to pay back the deficit, but to normalise for the next generation a system in which fundamental rights, to education, healthcare and security, are reserved for those who can afford it. This is not just about what kind of education we want, but what kind of society we want for those that come after us. Losing the tuition fee vote in parliament on ‘Day X’ in 2010 – the climax of the student revolt – was my induction into student politics (not the most inspiring moment to show up). But in the years that followed I probably spent a greater proportion of my time on political activity than actual studying. I was always pestered by the thought of my little cousins back home, too intimidated by the growing financial barriers to risk of ‘investing’ in their education; or as graduates sunk beneath toxic debt-burden that threatened their homes, their families; robbed them of their independence and forced them by the necessity of survival to accept the materialistic, careerist values of the Neoliberal Age rather than follow their passion, as I had. My grandmother had always impressed upon me the importance of education as the key to freedom, especially for girls. She had wanted to study astrophysics but her working class Mancunian background put it far beyond her reach (not that women were allowed to study physics back then anyway). My sense of that history, and fears for the future, made a powerful motivator that I feel as keenly now as when I started. The students are the lucky ones, I reasoned, and that gave us an obligation to fight for what our grandparents fought for after the war, and is now being stolen from us. The myth of dignity and security “from cradle to grave” is dead – what we are witnessing in Britain today is the worst decline in living standards since the 19th century. Child poverty is at its highest now since the war. Not since Queen Victoria has inequality in this country been so vast. The government’s austerity policy amounts to a systematic and spectacular theft by 1 per cent; but it is generating resistance. The Student Assembly Against Austerity, now backed by the National Union of Students, has been building a campaign of resistance to the sell-off on campuses up and down the country. We successfully petitioned 75 MPs to sign an early day motion against the sell off and coordinated a national week of action in February, with students taking action in over 50 universities, going into occupation at Exeter University and holding a protest and ‘debt-in’ in central London. 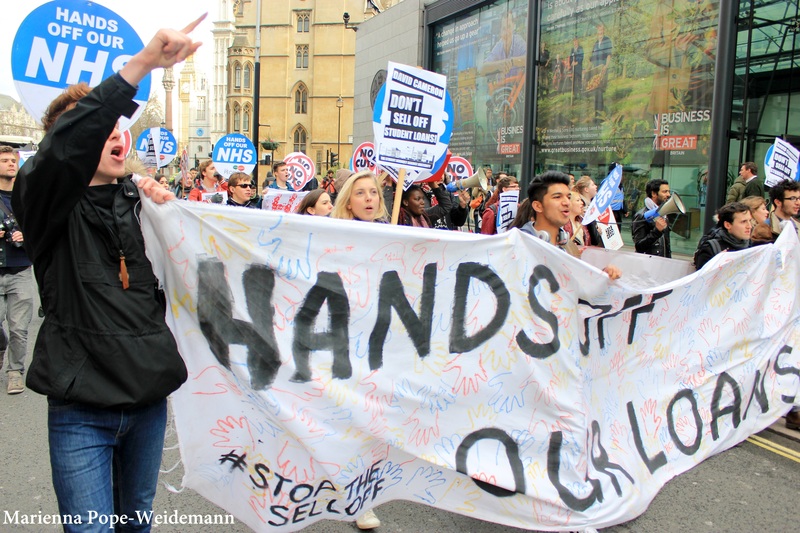 Student protests against privatisation and the real decline in staff wages have prompted an escalation of the campaign by management and police to criminalise it, which climaxed with mass arrests of students in central London last December. Ultimately, the students’ success will depend on our reaching beyond campus and taking a leading role in the broader resistance to austerity, which in so many other ways is exploiting the 99% to pay for a crisis created by the 1%. The People’s Assembly Against Austerity is now the largest anti-cuts coalition in the country uniting social justice campaigns, trade unions and community groups in opposition to cuts across the board. That the Metropolitan Police is now deploying water cannon on the streets of London for the first time explicitly to ‘control protest against on-going and potential future austerity measures’ shows that they know what we know: that the potential is there for a mass movement of people in this country who will not stand for the trashing of public education any more than the dismantling of the NHS, the emergency services, the libraries and public spaces, the abolition of the welfare state or the rise of right-wing racism that follows. The Student Assembly will be playing a central role in these campaigns moving forward while we continue to fight the student loan sell off. The students were alone in 2010. We were the first to come out on the streets. But now there is a movement of resistance building real national force and giving us the collective potential to take on the government – and win. So whether it’s on your campus or in your local community – get involved, and march with us on 21st June from the BBC that has too long ignored us, to a festival of resistance outside the parliament that is counting on us giving up and going home. They shouldn’t hold their breath.